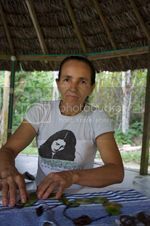 If you have purchased a Women for Conservation product please check on the back of the label for the name of the Artisan, you can then read their story here. We try to stay in contact with our artisans on a regular basis, but being that they live in remote areas phone and internet is very sporadic. We are currently awaiting the details and photos of more women who have recently joined the Women for Conservation project. If you can not find your Artisan on here please contact us and we will inform you when they have been updated. 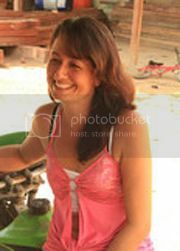 I am 42 years old, I am the mother of 4 and I also have a grandchild by my youngest daughter. We arrived in Puerto Pinzon 12 years ago because we were displaced from Tolima and we came to look for better opportunities for the family. At the moment I am validating my studies; I am doing year 6 of primary school. I am studying with other colleagues from the Women for Conservation group. I have the opportunity to work with the Proaves Foundation Project and what I would like the most is to learn as much as I can to be able to have my own business. Apart from teaching us and giving us work opportunities, we receive wages for our work and we help to protect the environment. I am 52 years old; I am the mother of 6 children. We arrived at Puerto Pinzon 12 years ago as we were displaced by violence. We used to live in San Luis Antioquia where we used to have land to cultivate and were able to work for our family. 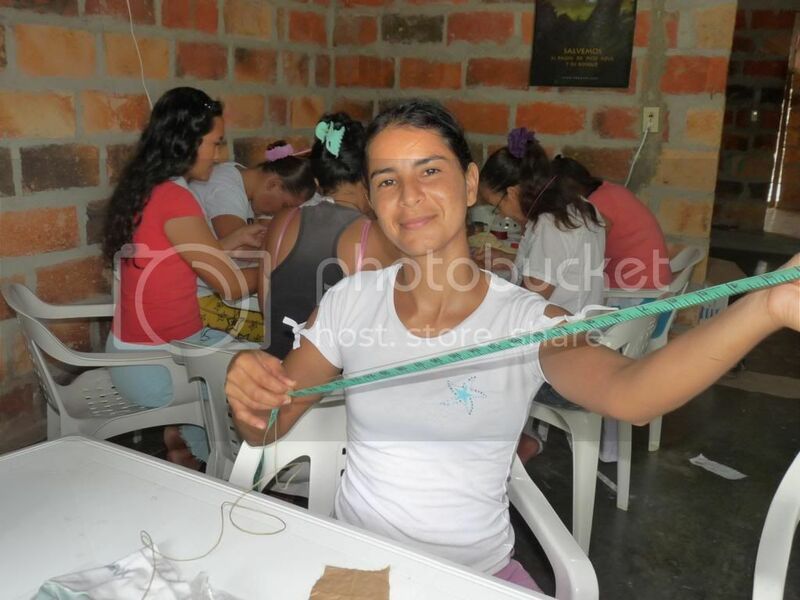 Here in Puerto Pinzon I live in a small wooden house with my younger children, I work in crafts with the Women for Conservation project and from the beginning of this year I have retaken my secondary school studies and I am currently in first grade. I study at night with other ladies from the project. I am 26 years old and I have a 6 year old son. I look after him at home. My job is to make crafts with the Women for Conservation group. I was born in Puerto Pinzon and I am grateful that I now have this job, the money that I have received has been very useful to meet my needs and I hope that the project will continue for a long time. In this town there are no work opportunities for women and now it is even difficult for men; that is why many families have to cut trees to be able to survive or hunt animals to sell them. In 2012 I retook my primary school studies at the Puerto Pinzon School. I am 35 years old, I am a single mum of 3 children and I have been displaced by the violence. I have lived in Puerto Pinzon for 12 years and I have always liked anything to do with the environment and animals. 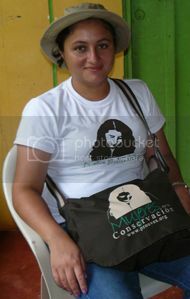 For a few months I have belonged to the Women for Conservation project and have liked the work they do very much. All of the workshops they do are very valuable to us because we have the opportunity to work in something that brings dignity to women, we also take part in reforestation, planting nurseries and keeping wormeries. I study at night and I am doing first grade of secondary school. Leidy was born on the 9th April 1992 in a town called San Luis in the department of Antioquia in the north-west of Colombia. 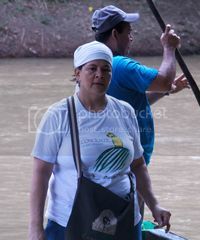 She now lives in Puerto Pinzon, a remote village near the Paujil nature reserve in central Colombia. 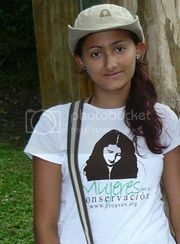 The village has very little opportunities for young girls like Leidy so they are at great risk of becoming prostitutes. Leidy is one of the very few who has been able to get to high school levels of education as most of the members of the Women for Conservation group have only had the opportunity to do the first few years of primary school. Leidy’s dreams and aspirations are to be able to finish her high school studies and to become a vet. I was born 10 July 1975 in the village of Otanche in Boyaca, Colombia. 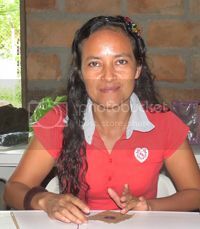 I live in the village of Puerto Pinzon, and I have 3 children and 2 grandchildren. My husband died suddenly in 2011 and I have been left to provide for the family, including my grandchildren. I finished primary school and was not able to study any further, the only courses I have been able to do are the ones provided by the Women for Conservation. I would like to be able to one day learn to speak English. I was born on 28 December 1989 in Samana, Caldas, Colombia. I now live in Puerto Pinzon in a rented house with seven other people. I am a housewife and part of the Women for Conservation group, which has taught me skills to make jewellery and earn money. I finish primary school and was unable to continue. Apart from the courses I have done with the project I have not learnt any other skills. I would like to be able to finish my studies and study I.T. Fabiola is the group leader and is very committed to her work, she is very good at encouraging the other group members and is in charge of receiving materials and organising the group during production. I was born on 21st October 1980 in Puerto Boyaca, Colombia. I now live in Puerto Pinzon in a rented house. I am fortunate to be part of the Women for Conservation group, which has tought me skills to make jewellery and manage the group. I would like to be able to learn to speak English.